Love the stripes. I'm obsessed with horizontal stripes right now too. I bought 3 RTW striped sweaters this past winter. We are sweating now, since it is summer here. I would abandon the old overlocker too. My Imagine is so fast to thread and the stitches so perfect, I could not go back. That's a really great top! I am partial to stripes myself. Wow - you are better than I am! My old one got kicked to the curb (donated to my daughter) and I never looked back even with my threading issues. Lovely stripey goodness! Now you've got me drooling over your serger. I have an old Elna that I got eons ago in college. It's at the repair shop right now b/c my lower looper thread keeps breaking. I really want a new one like yours. That last picture with the dog is so lovely - like something I expect to see in the Good Weekend magazine! It was 9degrees when I went to the gym this morning! It's not supposed to be that cold in Byron! I'm considering a dog jacket, too. Poor Molly crawled under the covers last night she was so cold. Great tee-shirt and I love the red jacket. 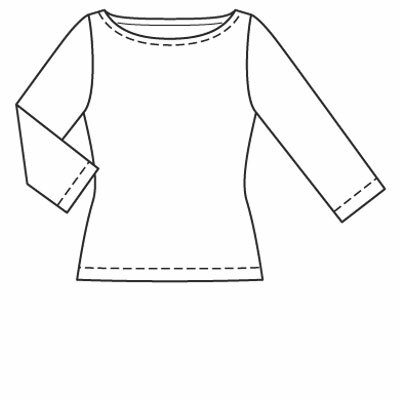 My DD1 has ordered a few t-shirts so I think this pattern is better for her than the one I'd planned on using. It sure is cold today! 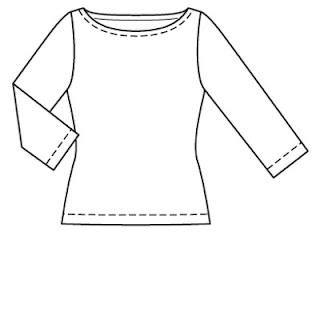 Thanks for your response to me about overlocker servicing. I took mine in this week. My wonderful servicing guy looked at it, said the timing looked okay then looked at the threading through the tension drums. 'It looks like the threads might not be all the way in" he said. Now it works like a treat!. Like the top...and hmmm macho red or blue for the dog? He will love ya forever! Today is sewing day... gotta go! Thanks for this - I desperately need new tees and have fabric in my stash for them. I've also just discovered Burda at my local library - yay!! Love it. You look great with the cherry red jacket. Go with the nautical stripes, if it's you, you'll enjoy wearing them. Life's too short to avoid wearing what pleases us, right? Any issues with the wide bateau neckline and bra strap over-exposure? BTW I also got a new overlocker a few years ago because threading my old one drove me nuts. The higher price was 100% worth it, because I quickly used this one and enjoyed using it more than the previous. Sometimes I would spend more time threading and re-threading than actual sewing for a project, and the time estimate of serging made me stick to simpler projects. A good machine is so liberating for creativity and enjoyment.